Protect your head with a Pit Bike lid! A Dirt bike helmet – it’s so critical. After the bike the most important item of equipment is your helmet. Never buy a used bike helmet, unless it’s never or hardly been worn. It’s best to spend on a good NEW one and use your money on a great motocross lid. There are some good USED bargains on eBay but if graphics or especially paint has been applied stay clear. Some paints contain chemicals, some not suitable for a dirt bike helmet . This can invade the surface of the helmet and it may let you down when you most need it. Buy new and high quality if at all possible. For dirt biking be sure to get a full face helmet these are built for their purpose and are far better for keeping your face out of dirt and grime, and protects your lower face and chin in an accident. Safe dirt biking always. You probably know that anything from custom dirtbike helmets to a dirtbike helmet on the street can be purchased cheap enough. But how good are they in dirtbike accidents? Well some advice can be sought from a dirtbike school or perhaps a quality dirtbike forum. 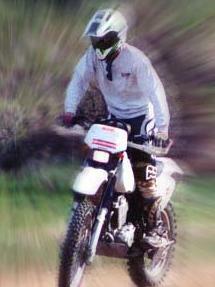 But what you really need to know is will your used hjc dirtbike helmets split when doing a spectacular dirtbike jump? We took some advice from slyfoxmx.com. As they state, your helmet dirtbike purchase is so critical. You should never buy used dirt bikes helmets; as you never know if that second hand youth dirtbike helmet is structurally sound. Sizing is important too, you need your motocross helmets to be snug, but not uncomfortably tight. Neither should it be too loose, if you do end up in a dirtbike wreck it may fall off your head; or spin to the side of your head so you cant see where you are – impeding your escape. When doing any extreme stunt; like a dirtbike backflip an mx helmet must be worn. If you’re riding dirtbikes and quads you should wear a helmet. Should you have bought cheap dirtbikes – save some cash for your offroad dirtbike helmet. OK, enough of the lecture lets see what goodies we can buy. As we were on slyfoxmx.com in any case, we took a look around. They had on sale an Oneal 548 Youth dirt bike helmet priced at $47.45. A nice dirtbikes for kids lid. It is DOT and Snell approved, with a polycarbonate construction exceeding Snell 2000, DOT, ECE and AS standards. And if you would like some more options how about an Oneal 508 Youth Lock & Chain Helmet for $49.95, and a 2008 FLY Motocross dirt bike helmet Bag for $31.30. Nice selections and nice prices – that’s why we like slyfox. Next along was mypurerush.com, with quite a number of motocross helmets. With most online catalogues you can see a dirtbike helmets side view or an outline of dirtbike helmets depending on how much effort has gone into the store. All this helps, as you need quality dirtbike photos on any pit bike helmet before deciding. 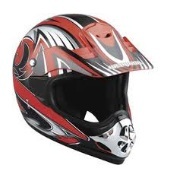 Purerush had an Extra Large Adults Black MX dirt bike helmet which was ECER22-05 Certified at a cost of £49.99. All the helmets we came across had a Light Weight structure with a six point ventilation Removable lining. The colours and designs were fine too; such as the Large Adults Green MX dirt bike helmet for £49.99 and a Small Adults Black MX dirt bike helmet for the same price. Why the extra large and the small helmet were all the same price we weren’t sure? Maybe the smaller guys should get a little cash knocked off – but at these prices you won’t go far wrong. Such helmets would be good protection for pulling dirtbike stunts and completing dirtbike wheelies. 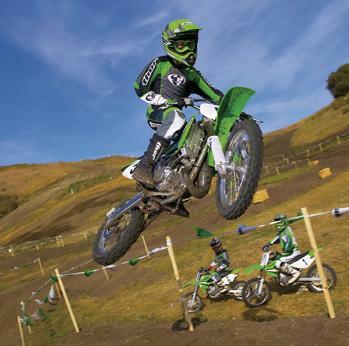 Of course how could we write this article without including dirtbikebitz.com. Their more expensive pitbike helmets like the 2009 Airoh Stelt - Cervantes Replica for £247.50 was reduced by 10%. And the 2009 Airoh Stelt - Evo Avenger in Black was the same price. This dirt bike helmet is EC22-05 Standard & ACU Gold Approved, A shell made of carbon and Kevl-ar and Double front, Chin, air intakes with many other features do make the riders life easier. The price difference of a motocross helmet. Getgeared.co.uk was up next, where a MADHEAD X1B Motocross Helmet caught our eye. The price too was attractive at between £34.99 – £49.99 in price. Again this helmet was ECE 22-05 safety certified, removable lining within and included forehead and chin vents. Or if you would like something a little more “pro” then maybe a MADHEAD Multi X Orange Graphic Motocross Helmet would suit you? Built to ECE 22-05 safety standard, ACU Gold racing certified and high equipment levels and finishing all for £69.99. 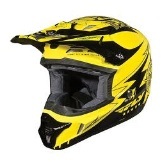 These helmets should keep you safe on the dirtbike tracks riding your freestyle dirtbikes to the limit. To close, ebay was our last stop. We spied a brand new kids moto x helmet, at a fantastic price of £34.99. ECE 22-05, AUC approved with a built in ventilation system and a lightweight alloy shell, it looked great. Although colours were limited, it even came with its own helmet bag, so never forget ebay. Helmets are critical if you have a dirtbike crash. Your more at risk of course if your dirtbike jumping or racing. Ideally any dirtbikes for kids to ride on must firstly be issued with a helmet and all the correct safety gear or they could be in a dirtbike wreck (or spill), and no-one wants that.